Funding from the Miegunyah Bequest enabled the Baillieu Library’s most requested work of art, The Dragon Devouring the Companions of Cadmus (c.1588), to be conserved. 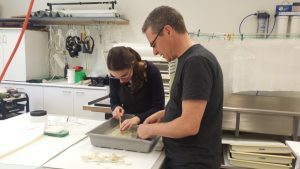 Treatment was carried out by paper conservators Peter Mitchelson and Adele Barbara, who explain this intricate process. While Hendrick Goltzius’ 16th century engraving, The Dragon Devouring the Companions of Cadmus, arrived to the laboratory in a good condition for its age, a thorough conservation treatment was required to bring the print back to its former glory. The print itself was mounted onto acidic backing board, which prevented access to the back of the work and was potentially a catalyst for degradation into the future. Edges of white paper visible along an edge of the print indicated that it had also been lined in the past to repair tears and strengthen the work. In order to discover what was hidden behind these layers, and allow the print to be repaired and cleaned effectively, these backings had to be removed. To remove the mount board backing, the engraving was placed face down on a flat, even surface. As the support was adhered in all four corners, most of the board could be cut away. What remained was carefully pared back with a scalpel. Beneath this backing, however, another layer or partially removed backing, with the hint of an inscription showing through, was uncovered. This backing differed from the first in that it had mostly been removed. Due to the presence of an inscription, though, it was decided that these final layers had to be removed. A poultice of methylcellulose was used to gently moisten the remainder of the backing before it could be carefully scraped away. Once this final layer was removed, the lining paper adhered to the back of the work could then be considered. After trialling the use of a high-pressure steamer to remove the lining with little success, testing was conducted investigate what was adhering the lining so strongly to the back of the print. Spot testing using a potassium iodide solution revealed that a starch-based adhesive was used during the previous treatment. Consequently, it was decided that the most effective way of removing the lining would be while both the lining and the print were wet. To achieve this, the print was placed in a bath of warm deionised water face down. Using soft brushes and hand tools, we were gradually able to carefully peel back small sections of the lining until it was completely removed. After the lining was removed, however, a sticky residue remained behind. 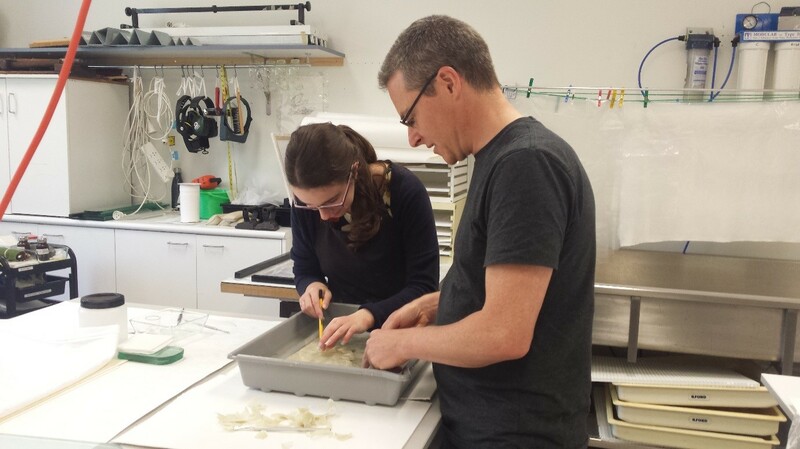 To quickly remove the adhesive before the print dried, the back of the work was carefully swabbed with small cotton swabs. Once this process had been completed, the print could then be thoroughly washed in deionised water. This process allowed for any remaining dirt or degradation products to be released, stabilising and cleansing the print. 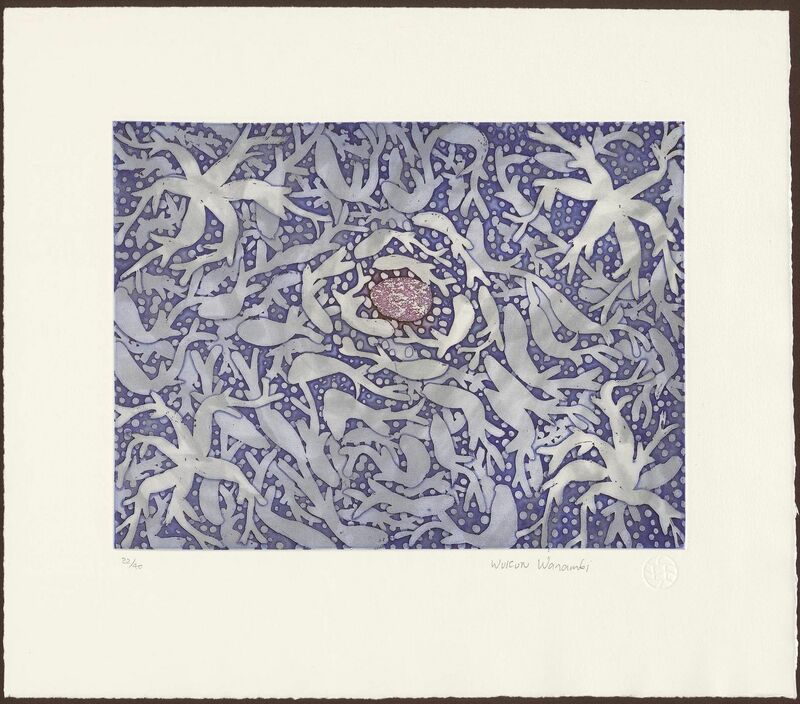 Once washed, the print was flattened to allow for repairs to be made to the tear on the front of the work. During the removal of the lining, a historic infill was removed from the top right corner of the work. We have selected to retain the original fill, but will instead secure it with discreetly with Japanese tissue. 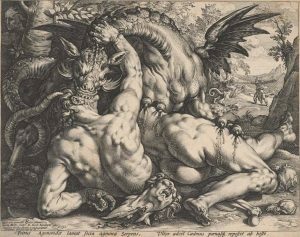 Once the repairs are complete and the engraving is mounted, The Dragon Devouring the Companions of Cadmus may return to the Baillieu Library Print Collection to be displayed and enjoyed for years to come. Women artists working during the 16th and 17th centuries were few, or that is, only a small number came to prominence in the Western canon of art. This may be explained by the many obstacles placed in the way of aspiring female artists, for unlike their male counterparts, they had no guild to support them, which in turn made earning a living through the sale of their art very difficult. [1.] 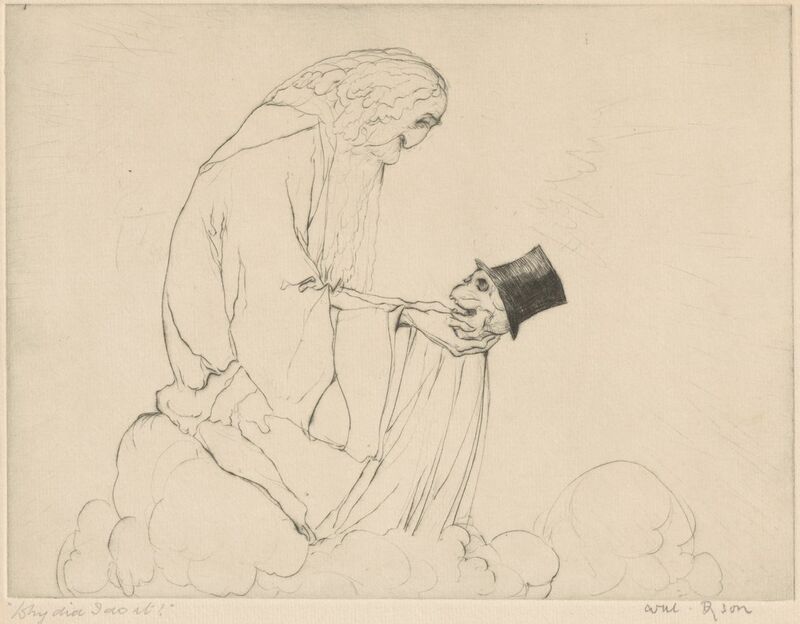 Students of art history are frustrated by this, and lament their under representation in both the history books and in the Baillieu’s Print Collection. Thus, it is a pleasure to highlight one of the women who triumphed over the challenges and became a renowned artist of Bologna: Elisabetta Sirani (1638-1665). She was taught by her father Giovanni Andrea Sirani (1610-1670) who was also an artist, one that she surpassed in both reception, and in the number of works produced. When he became ill, Elisabetta ran the family studio, and she went on to found a school for women painters. Paintings make up most of her corpus, however, she also made drawings and was a printmaker. The etching Holy Family with St Elizabeth and St John the Baptist (1655-56), is not after another famous work of art by a male artist, but is rather a design of her own. 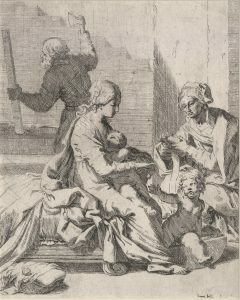 It conveys an intimate domestic scene with the Virgin Mary nursing Christ and amusing the infant Saint John by dangling an object from her hand. 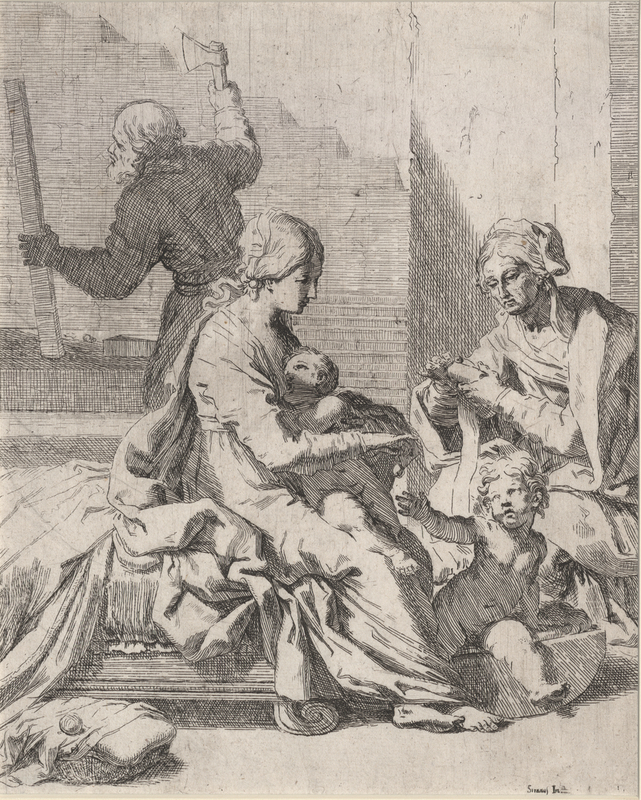 An aging Saint Elizabeth is perhaps winding swaddling cloth, and in the background, Saint Joseph is at work with wood and axe. The architectural devices that dynamically intersect the backdrop are a clever compositional feature. 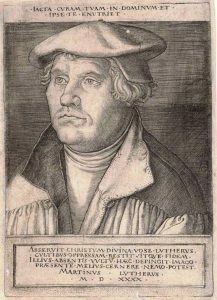 Forget about Halloween, the 31st of October is Reformation Day, and 2017 marks 500 years since the German monk Martin Luther (1493-1546) nailed his 95 thesis to the door of a church in Wittenberg. That thesis sparked a religious revolution which resulted in the Protestant Reformation. This event changed the spiritual landscape of Europe and beyond. 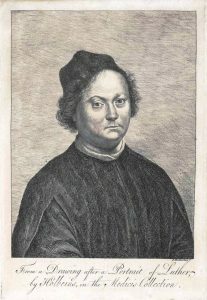 Along with the publication of controversial texts, Europe was flooded with printed pamphlets and images; the Protestant Reformation also helped to marshal the development and evolution of the print medium. The Rare Books collection at the Baillieu Library holds a 1518 copy of Luther’s Resolutiones disputationum de Indulgentiarum virtute (Resolutions on the disputations about the power of indulgences). 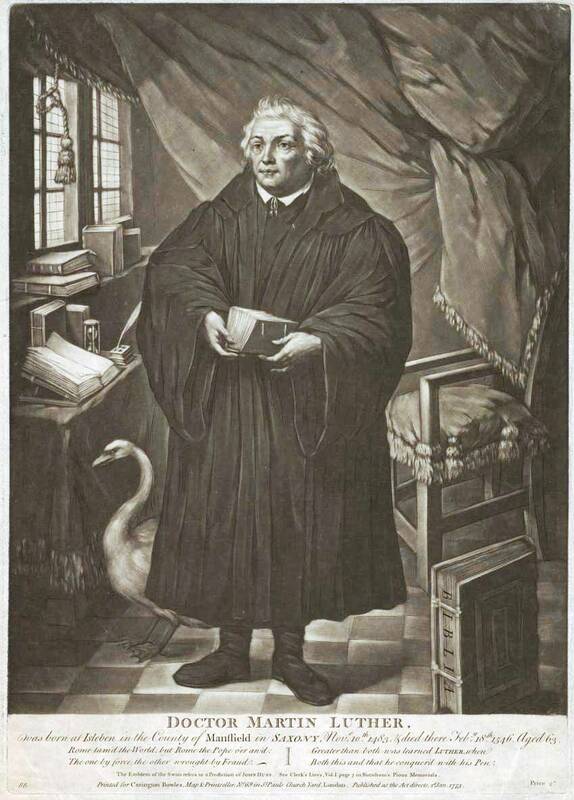 While three very different portraits of him from the Baillieu Library Print Collection show that attempting to frame Martin Luther and his legacy is a very complex exercise. ‘May I have a volunteer to cut off their hair.’ This was the arresting opening statement to the art history tutorial led by Yolngu elder and artist Wukun Wanambi. Students soon presented their heads to have a piece of their hair snipped off and then looked on with fascination as the hair was transformed into marwat (paint brush), which then shaped an image, as the artist created marks on paper with the brush and gapan (white clay) transported to the University from the Northern Territory. Wukun Wanambi is a frequent visitor and advisor to the University of Melbourne and the Library is delighted to now have one of his prints in the collection. 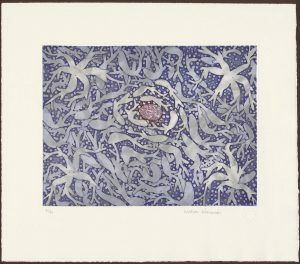 The etching Wawurritjpal V (2006) was one of five prints gifted by Dr Susan Lowish through the Cultural Gifts Program in 2017. The prints were all made in the Yirrkala Print Space at Buku-Larrngay Mulka in the Eastern region of Arnhem Land. Like many Yolngu artists, Wukun Wanambi has a high profile international career. He visited London in 2013 and created larrakitj (hollow log memorial poles) for the 2015 British Museum exhibition Indigenous Australia: enduring civilisation. In 2017 he travelled to the US to work on a major forthcoming Aboriginal art exhibition. Wukun inherited the rights to paint the saltwater imagery of the Marrakulu clan. Wawurritjpal V expresses an ancestral story which frequently appears in his artistic practice. 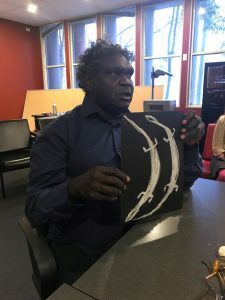 The prints produced in the dedicated facilities at the Buku-Larrŋgay Mulka Centre demonstrate many exciting innovations and developments since Aboriginal artists first took up Western printmaking techniques in the 1960s. 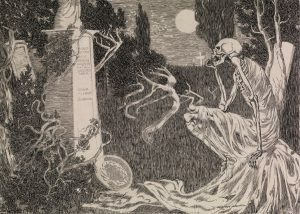 The exhibition Romancing the skull at the Art Gallery of Ballarat opened to the public on October 14th. 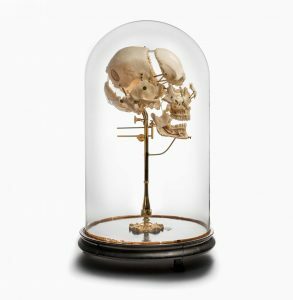 Object loans from three of the University’s Cultural Collections (Harry Brookes Allen Museum of Anatomy and Pathology, Rare Books and the Baillieu Library Print Collection) are key features of this edgy and multi-layered show. The Nuremberg Chronicle, open to the image of the Dance of Death, and the exploded skull model by Tramond & Co. are some highlights. Romancing the skull is an exhibition both for lovers and for lovers of skulls. These enthralling objects will be on display in Ballarat until January 28th 2018. Will Dyson, Why did I do it?